Don't let your student loan debt stop you from moving forward with your education! 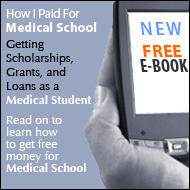 The good news is that Medical School Loans offers you options that can help you to manage the student loans that you already have, while you get ready to borrow more for medical school. An option that is extremely beneficial in helping medical students with their undergraduate loans is consolidation. Consolidation merges your multiple student loans into one, easy-to-manage loan. As a result, there is only one low payment each month made to just one lender. This will add much-needed simplicity to your life. In addition to saving time, when you consolidate your loans with Medical School Loans, you can actually save thousands of dollars over the life of your loans, and potentially lower your monthly payment by almost 50%! When you consolidate your federal student loans with Medical School Loans, you will receive a fixed interest rate. This will save you from paying extra on rising interest rates, as loans with variable interest rates are adjusted annually by the federal government. Once you consolidate with Medical School Loans, your fixed interest rate will stay constant throughout the life of your loan! Consolidate Now and then Consolidate Later! If you consolidate your undergraduate loans and then choose to go to medical school, you will be entered into an in-school deferment. This will allow you to defer payments until you have earned your M.D. and your grace period has ended, as long as you are enrolled in school at least half-time. Once you have received your degree, you can add the balance of your medical school loans to the initial consolidation of your undergraduate loans. Again, this gives you just one loan, and you will continue saving thousands off of all of your loans! As a leader in the medical student finance industry, Medical School Loans knows what it takes to help our borrowers achieve their educational goals, as well as manage their student loans. Because Medical School Loans offers our specialized services exclusively to medical students and physicians, we can provide the highest quality of service to our borrowers. Our unique one-on-one service allows our borrowers to talk to the same loan representative every time that they call in with a question or concern. This gives our representatives an opportunity to become familiar with your loan and your specific needs. In addition to saving thousands of dollars and receiving excellent customer service, when you consolidate with Medical School Loans, you will be able to take advantage of the other incredible benefits that we offer our valued borrowers. To accommodate all of your loans, we offer both federal and private student loans. We also offer money-saving features such as interest rate reductions, flexible repayment options and extended repayment terms of up to 30 years! The bottom line is that if you choose to continue your education by attending medical school, and you already have student loan debt, we can help you make it happen! Medical School Loans is here to help you move forward with obtaining your medical degree, all the while helping you manage your loans and most importantly, helping to save you money!